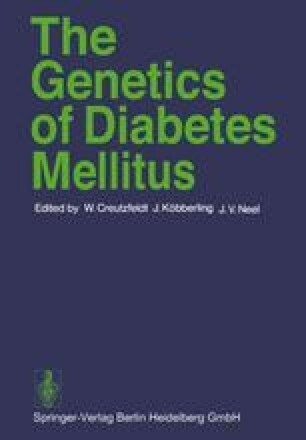 Despite the fact — known for centuries — that diabetes mellitus is a familial disease, the genetics of this disease are still poorly understood. The most important hindrance to a proper genetic study is the fact that the basic defect in diabetesis unknown. Therefore, no method exists for detecting individuals who possess the diabetic genotype but who have, as yet, no signs of abnormal carbohydrate metabolism (11). The clinical syndrome called diabetesis complex and any search for a common etiological factor may over simplify the problem. However, many studies have shown that a subject with diabetes releases after glucose load too little insulin too late relative to a comparable but nondiabetic individual. Thus, an abnormality in the pancreatic B-cell appears central to the disease and the most simple definition of diabetes is absolute or relative insulin deficiency.